"Phil Stewart is a hero. I have just finished my Program (and plan to carry on with Phil's programs). During my 10 weeks I lost 18kgs of fat, gained 3kgs of muscle, learned how to use a gym, improved my body shape, came down 2 clothing sizes, replaced my wardrobe, improved my skin, increased my energy levels, improved my relationship with my wife, inspired my son, increased my self-esteem, I now work better, and am envied by friends who have been struggling trying to achieve results on their own. Phil is worth every cent. I have changed my life, and I know I can maintain it." "I was a total 'no gym' bunny, but I began with the gym sessions 3 times a week, and now still go weekly 6 weeks after completing my 10 week Program. I love the running style, and the Body Transform Audio Trainer CD I could put onto my iPod, having Phil there with me every step of the way." Now that I’m finished my Program I’m still sticking to the habits. When I think about all the benefits of exercise and healthy eating, and how I would actually be missing out and feeling worse for not training, I find it difficult not to do it! "It was amazing and very powerful to have Phil coaching us the entire way through. The experience of someone who has been through what we were going through was invaluable. I would recommend Body Transform to anyone who wants to look and feel incredible and who wants to make a positive difference in ALL aspects of their life! Thank you so much Phil, it has been a fantastic journey!" "Phil is passionate about what he does and helping people achieve their goals. Without him I could not have found a new way of eating and exercising that continued to be part of my every day life well after he had finished coaching me." "Phil's energy and passion was contagious and spurred me on even more. The weekly contact was hugely beneficial. I would begin each week more determined every time. 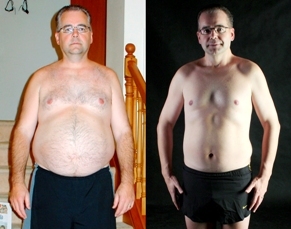 I feel healthier and fitter and have no regrets; I would recommend this course to anybody." Don't be like others who have tried to get in shape by addressing just exercising or dieting alone. Be smarter and save time by employing exercise, nutrition and motivation in the right balance in a complete program. Take advantage of combining exercise and nutrition actions that are extremely effective, and see noticable change within the first 4 days. Read on to see why the Program has a high success rate. Results Range: what results you can expect in that time. None of us have got several hours free in our day for exercise. We need to get results from short workouts. Secondly, we don’t want to have to wait weeks and weeks to start getting results. If we do the work, we want to be rewarded for our efforts right from the start. We're not talking hours and hours each week in the gym. 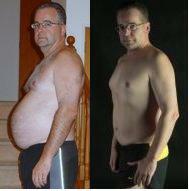 We're talking about a very complete physical change from just a few hours a week exercise for just over 2 months. This is seriously efficient (and anyone can fit it in). The second thing to consider are the results you will get. 1. Can I expect weight loss and muscle toning, or just one of the two? 2. Can I continue on with the habits over the long term so I can actually stay in great shape? 1. Combine weight and cardio trainings in an appropriate balance. So you get lean and fit at the same time as you get strong and more muscular. You can do both at once. So we do. 2. What you do is simple and repeatable. No fancy exercise equipment or special foods required. Just proper exercise and balanced eating done well. So you can keep doing it. There is another major benefit that you need to consider. Whilst it’s not as easy to measure as your weight or clothes size, it’s just as real. It’s a little thing called energy. When you are in shape you have much more energy than when you are not. It’s a clear result of the proper exercise and nutrition. When you have more energy, you can do more, and live more. Whether it be during your working day, spending time with friends and family, or approaching other goals and ambitions. Energy breeds energy. When you have more within yourself, you have more to use in whichever way your choose. Things that you might have been struggling to get round to begin may become much easier to get started. Problems that you might have been trying to solve may become a little clearer. And so on. It’s an interesting process, and it’s very real. “Now I have constant energy, I’ve gained confidence in myself and my ability to commit to something and consistently follow through to achieve a great result – a great skill that is useful in many areas of life." When you are in shape and enjoying higher and more stable energy levels, your mood is stabilised and elevated. This means that you have a more constant energy through every day. And you just plain feel better. These above benefits, that affect your entire life, will prove to be just as valuable to you as the benefits to your body. What is the 10-week Program all about? Over 10 weeks we take advantage of scientifically-proven practices for both exercise and nutrition. I know these are the correct actions to take, so I call them Right Exercise and Right Nutrition. Every action in the program is based on tried-and-true principles that have worked for literally thousands of people around the world. • Short-duration trainings – each weight training is no longer than 45 minutes. The aerobic trainings are only 17 minutes long! Cardio training and weight training done together has a double-impact on fat loss. Cardio trainings specifically target burning body fat. Building and toning lean muscle speeds up your body’s metabolism. A fast metabolism helps your fat burning and makes it very difficult to store new body-fat: muscle is your ‘safeguard’ to keeping lean. Weight training is now considered within the fitness and medical community to be essential for overall health and illness prevention. You gain improved physiology and posture as your muscles become sufficiently strong to hold your body in correct alignment. You experience a reduction in back tension and pain, which reduces stress throughout your body. You gain increased bone density, and you will definitely get more energy, strength and plain-old confidence. Short-duration interval cardio training is proven to stimulate fat-loss, even well after you have finished exercise. This training style drastically increases the production of the chemical catecholamine when compared to longer constant-speed exercise. Catecholamine is the key ingredient that triggers your body to start burning fat for energy, and it stays in your system for 36 hours after you finish this type of exercising. So the more of this chemical you can induce during exercise, the more fat you will burn for longer after exercise. The outdated slow and longer-time cardio training style does not induce this fat-loss benefit. It's very straight-forward. If you can understand the above, you will be able to grasp the specific details of Right Exercise straight away. Of course, I will work with you to tailor your specific program to suit your own goals. • Each meal contains equal-sized portions of carbohydrate and protein. (For most people, this means they eat less carbohydrates and more protein at each meal). • Eat regular foods – just learn which to have more of, and which to have less of. Increase your metabolism, therefore support the burning of body-fat. An increased metabolism is a further ‘safeguard’ against gaining any further body-fat. Reduce the likelihood of eating excess carbohydrate (particularly sugars) at any one time, thus reducing the chance of excess bloodsugar energy being converted to body-fat. Increasing your protein intake has several benefits: stabilising energy levels; development of lean muscle mass; feel fuller for longer, reducing any hunger and need to overeat. Your free day allows you to enjoy what you want when you want it. This certainly helps to keep you on track the other 6 days and makes the eating style sustainable. "The best thing about Body Transform for me was finally learning about food. It only took me a few weeks, but now I know all I'll ever need to know about what works for my body. This alone makes it all worthwhile - losing 9kg was great too! Thank you Phil for making it so simple." Right Exercise and Right Nutrition are presented to you in a simple manner and in a few short weeks become second-nature. But we all know that actually getting out and doing the right thing can be the hardest part. That’s why you have to develop some form of motivation before you begin. The risk of letting yourself down in just too great. Body Transform was created from the inside out - with a major focus on motivation. Motivation can be learnt and practiced like any basic habit. Just like I can teach you how to perform a bicep curl properly, I can teach you how to become sufficiently focused and motivated. So how do you develop enough motivation to get the job done? Begin with clear reasons why you want to get in shape. Really feel what it would be like to achieve your health and fitness goals. What if you could finally have them, all inside 10 weeks? Imagine surprising your friends or family with a completely different body shape. How much fun would that be? Imagine fitting into all the clothes you really want to wear. Would that feel cool? See yourself filling out the arms of that t-shirt properly. Sound good? It’s not just a far-off goal though – you really can get there soon. Just by taking action. Feel it now: taking action towards your goals is actually far less painful than sitting around wondering how or when you will finally get in shape. This is the beginning of motivation. It’s a feeling more than a thought. You’ll feel it in your stomach, not in your head. There are several different layers to being motivated and several different ways to achieve it. We all ‘get it’ in slightly different ways. There are techniques within the program that will work for you. If just the knowledge of what to do was enough, everyone would be in great shape, right? You would just have to learn the right thing to do and then doing it would be automatic. But for most people, it’s not automatic. We need to find a little guidance and support from an expert. It may not even need to be much. But even just knowing that someone is there to help keep us motivated and on track makes the world of difference. "I remember thinking to myself, “I can do this on my own”. That was until Phil pointed out to me that if I knew how easy it was to do, I would have already done it. This really struck me, as I had done eating plans before, and have been exercising all my life. The thing is, I had always found it very difficult to lose weight, even when I was training twice a day and eating healthy foods." Learn more about the Exercise, Nutrition or Motivation components of the Program. "Thank you for showing an interest in your own transformation. I appreciate the opportunity to assist you in your health and fitness goals."